Here’s another service that offers a free plan. So what’s the catch? Scroll below to find out everything you need to know about SkyVPN. SkyVPN is a “free” VPN for mobile and desktop users. For desktop users, only 500MB is available to use. After using that 500MB, users can opt to buy the product for various plans and prices. Mobile users, however, can still access it free of charge – as long as they watch ads and complete various missions, of sorts. They claim to provide secure connections with high speed and unlimited bandwidth to both free and premium users. Access to geo-restricted content is also one of the features of their VPN. Let’s see if what they’re offering is really worth your time and money. Netflix Test: Yep, Netflix is a-go! We’re very happy and satisfied to report that Netflix is available with SkyVPN. Users of SkyVPN can enjoy binging on different series, anime, and movies available on Netflix. It’s quite rare to find a free VPN that allows users access to Netflix or similar streaming services, so this is a big win for SkyVPN. Looking for other Netflix-accessible VPNs? Check out our top picks here. SkyVPN’s interface is clean and straightforward. A big button in the middle connects users to the server of their choosing. Above, users will find the drop-down button containing server locations to choose from (but not the server itself). Buying a premium plan and giving feedback can easily be done within the program. The first free 500MB of the desktop version doesn’t require an account to use. To get another 100MB of bandwidth, you’ll need to create an account. Creating an account is very simple. All they need is your email and password. That’s it. You get another 100MB to use for your desktop. Overall, a pretty simple and easy process. It’s just a shame that free accounts are so limited! 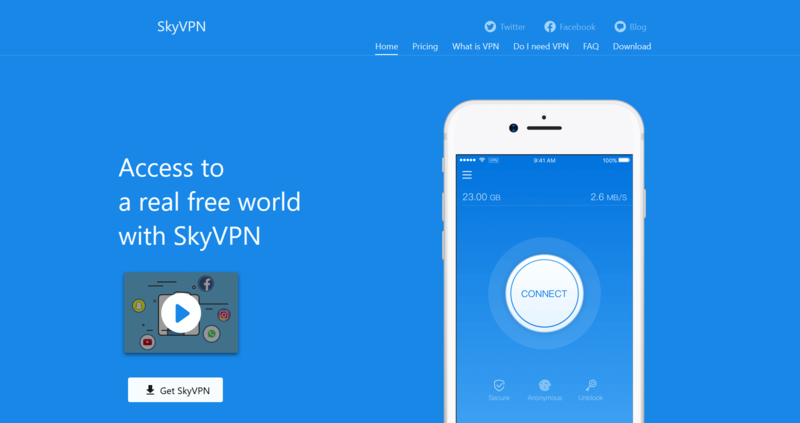 SkyVPN lets its customers use their VPN without fear of being tracked; the VPN features a no logging policy. This means your browsing history, traffic data, and DNS queries won’t be logged. We have no way of proving that SkyVPN keeps their word here, but the fact it’s in black and white on their page means they at least commit to that ethos. Users can subscribe to SkyVPN by using PayPal and credit cards. Though PayPal is widely used, we would like to see SkyVPN provide more options for customers who use Bitcoin and the like. SkyVPN provides just 10 different servers from North America, Europe, Asia, and Australia. Users who are looking for a healthy dose of servers to choose from should look elsewhere. 10 servers is a number lacking by anyone’s measurements. When paid VPNs offer thousands of servers, it makes SkyVPN’s offering pale in comparison. We were disappointed with the results of the speed test. 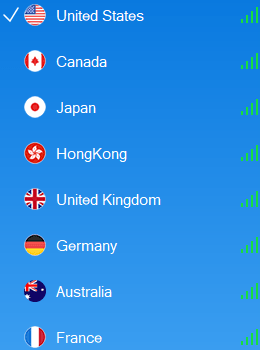 Among the 10 servers, we tested three: United States, Germany, and Hong Kong. If SkyVPN thinks 5 Mbps is super-fast, then we guess they hit their mark – but they’re wrong. It’s pretty disappointing to see how SkyVPN is a paid VPN service, yet fail to provide an acceptable connection. The test showed that SkyVPN only has a download speed of 5.38 Mbps and an upload speed of 7.86 Mbps. At a time where many services are offering gigabit servers, a paltry 10 Mbps or less is simply unacceptable – free or not. If you were planning to do some torrenting with SkyVPN, you’ll be disappointed. SkyVPN doesn’t support torrenting, and if you try to torrent on their US, UK, CA, and FR servers, your account will be terminated. No torrenting here, but you can find plenty of VPNs that do allow it right here. SkyVPN is available both for desktop and mobile devices. The mobile version is free but bandwidth is earned through completing missions and watching advertisements. Meanwhile, the desktop version only provides 500MB for initial use. To get more bandwidth, users must purchase a plan. They offer a mobile plan and a universal plan; the mobile plan costs $1.49 a month for 12 months and $4.99 if you pay monthly. 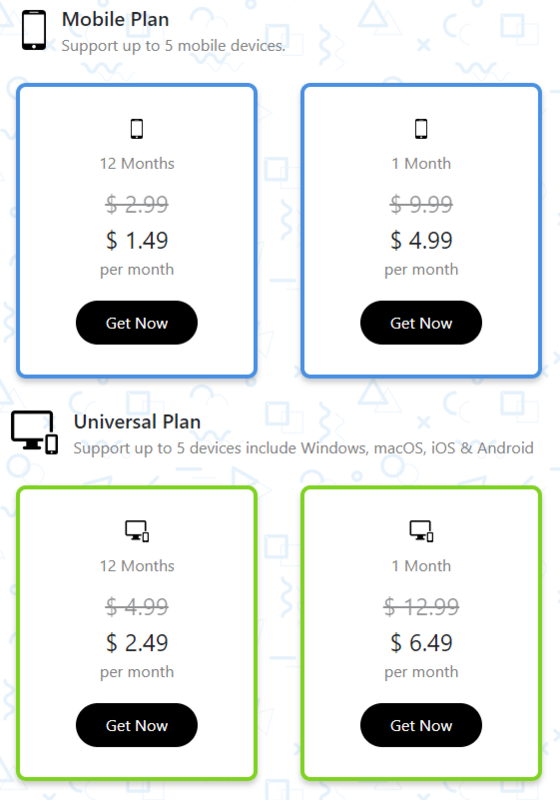 The universal plan, which can be used for desktops and mobile phones, costs $2.49 a month for 12 months and $6.49 on a monthly plan. Both plans have unlimited bandwidth, or so they say on their home page. We dug around their page a bit more and found that they have a fair use policy. SkyVPN considers 600MB traffic per day as fair usage. That’s like one YouTube video in 1080p! Users who are thinking of purchasing SkyVPN should be 100% sure they’re satisfied with the VPN because all purchases from SkyVPN are non-refundable. We hate the idea that a dissatisfied customer can’t get a refund, which is why this section is squarely in the Cons section. 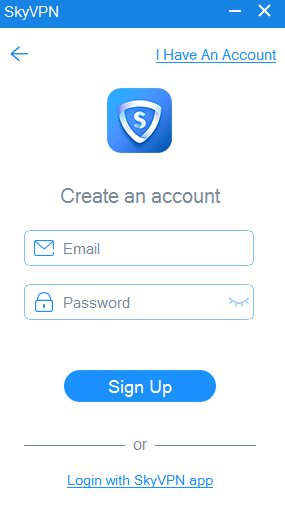 Most desktop and mobile users will find themselves able to use SkyVPN’s service, because the VPN is compatible with Windows, Mac, iOS, and Android. Unfortunately, there’s no support for more niche devices, like Smart TVs, Raspberry Pi, or routers – something we appreciate in a good VPN. Note that one account can be simultaneously used on 5 devices. That’s a decent number. 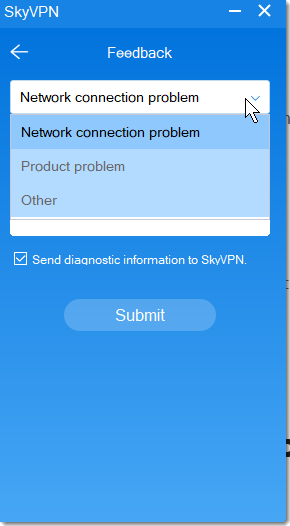 For users who have issues with SkyVPN, we wish you luck in troubleshooting. SkyVPN’s FAQ page contains the bare minimum information about the VPN and doesn’t contain any technical information. The VPN also lacks live chat support and their support page seems to be malfunctioning completely. They can be contacted through their feedback page within their application. We’re not too certain on how long they take to respond to feedback or if they provide any help to users who have sent inquiries through the feedback page. It’s all a bit of a mystery. They have a blog but it doesn’t contain any information on troubleshooting. It’s more of an ad-archive with all their articles on how useful SkyVPN is. Overall, a very lacking support offering. New VPN users, beware. If you run into trouble, don’t expect SkyVPN to come to your rescue. You may just have to save yourself. IP and DNS Leak Test: Leaks, leaks everywhere! 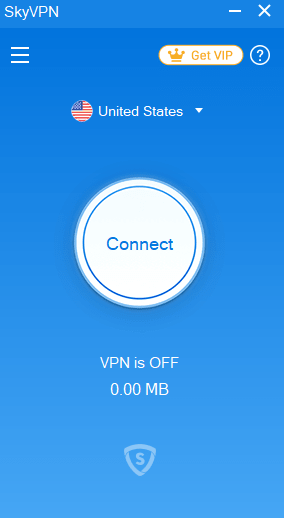 Besides a super-fast connection, SkyVPN also promises a very secure connection. We were already disappointed with the speed of the VPN and we were further disappointed with the DNS leak test. This is a red flag for a VPN. Most VPN users are looking to be anonymous when surfing the web, and SkyVPN doesn’t provide the security to do that. What is a fairly basic requirement for a VPN, SkyVPN seems to fail at. Bummer. SkyVPN claims to let its users surf the web anonymously and privately with 256-bit AES encryption which is considered to be military grade. It’s good to know SkyVPN uses secure encryption protocols but they do not state exactly which protocol they use. You won’t be able to customize the protocol type to your liking, unlike on other (read: better) VPNs. Sadly, SkyVPN doesn’t have a kill switch. Not an unexpected result, but still disappointing regardless. A kill-switch will protect you should your connection to the VPN falter – ensuring your personal IP and other details remain anonymous. We always recommend users opt for a VPN that provides a kill-switch – something SkyVPN doesn’t provide; another nail in the coffin for an overall disappointing VPN service. The creators of SkyVPN remain anonymous. There’s no creator or about page on their website. In fact, we struggled to find their creators even searching the web. Who exactly owns or runs this VPN? We’re not sure – and that makes us very nervous. Most VPNs have their company based in countries within the 14 Eyes Alliance. This may bring some amount of fear or doubt within users but not to the users of SkyVPN. According to their Terms of Service, SkyVPN is based in Hong Kong, meaning there is no fear of mass surveillance by the 14 Eyes Alliance. That said, China is notorious for its invasive citizen surveillance and similar practices; should this extend to SkyVPN, there’s no guarantee your data is safe. Typo or sneaky legal trick? You decide. SkyVPN could be better – a lot better. The VPN provides a very lacking amount of servers and offers extremely slow internet speeds. They claim to provide a secure connection, but our tests showed us our DNS was still visible. There’s a lot of room for improvement for SkyVPN; they seem to lack the fundamentals of a good VPN. Their redeeming features are their access to Netflix and a clean interface. Overall, a weak offering considering the price. If you have money to spend and are looking for an incredible VPN for a great price, check out our top VPN picks here.